You are at:Home»Columnists»Join Fr. Frank Pavone’s Urgent Plea: Release Baby Joseph’s Medical Records! As I’m sure you know, the now-famous case of Baby Joseph in Canada is becoming critical. 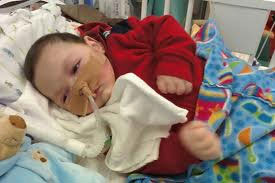 He could die in the next couple of weeks if his breathing tube is removed as the hospital and the government intend. Baby Joseph is only 13 months old and often has difficulty breathing on his own. He needs a procedure called a tracheostomy in order to go home and live under his parents’ care. However, the Canadian health care system is refusing to let the family take care of their son — even though hospitals in the United States have privately said that they would take Joseph in and give him the tracheostomy he needs to survive. U.S. doctors and hospitals who are now familiar with the case are appalled that Baby Joseph hadn’t received the tracheostomy 3 or 4 months ago rather than make the baby suffer all this time. Baby Joseph’s parents are pleading with the world for a hospital with the courage to step forward and accept their son for evaluation and treatment. Priests For Life has even agreed to supply medical air transport to and from the facilities. We will support the cost of the hospitalization and after-care including nursing. Home ventilators have also been donated to maintain Baby Joseph if needed. There are U.S. physicians in Michigan willing to oversee Baby Joseph’s outpatient care and assist in weaning him off the home ventilator should it be necessary. We have yet to find one facility that said it would not perform the tracheostomy on Baby Joseph. The real problem is that health care providers in the U.S. need Baby Joseph’s medical records — but the Canadian authorities are refusing to release them. Therefore, I need your help to continue to contact the Canadian authorities so that a proper and humane solution to this problem can be found. We have recently discovered that Canadian law requires the hospital to release these records to Baby Joseph’s parents upon request. And to date, they have refused. This is what is preventing hospitals in the United States from being able to accept Baby Joseph. We need those medical records! And we need them now! Therefore, I urge you to click here and send an email to the Canadian officials who oversee the London, Ontario hospital requesting that the medical records be released immediately. We are continuing our search for a hospital in the United States to take Baby Joseph, and they won’t do that without the records. So please send an email to the Canadian authorities — and at the same time say a strong prayer for Baby Joseph and his parents. Time is running out, so please act now. Again all you need to do is click on this link and action can be taken in this life-or-death case. And while you’re on your computer, please [send this link]to everyone you know, and we may have a strong chance of saving Baby Joseph from a cruel death. P.S. There are currently many false reports and rumors in the media that Baby Joseph is in a persistent vegetative state. He’s not. He’s only 13 months old, and simply isn’t getting the care he needs. Any baby would suffer if not given proper care. So please don’t listen to the same kind of lies and distortions that caused Terri Schiavo’s untimely death. This is why it so important that the medical records are released so the truth can come out. Previous ArticleWho Does It Hurt? Thank you, father. Message sent and “Liked” on Facebook. Fox is reporting that Baby Joseph is being taken to St. Louis, MO by Fr. Pavone.